Millions of Australians are being asked to take a free online LIFE CHECK on a new website launched for the new year. Ten million Australians aged 45 and over can now access free advice to plan and take positive steps towards better health and greater security. Average Australian life expectancy is now 82.5 years and it is projected by 2050 there will be more than 40,000 centenarians. The online Life Checks cover four areas that research has shown are keys to our wellbeing: HEALTH, WORK, FINANCE and SOCIAL LIFE. 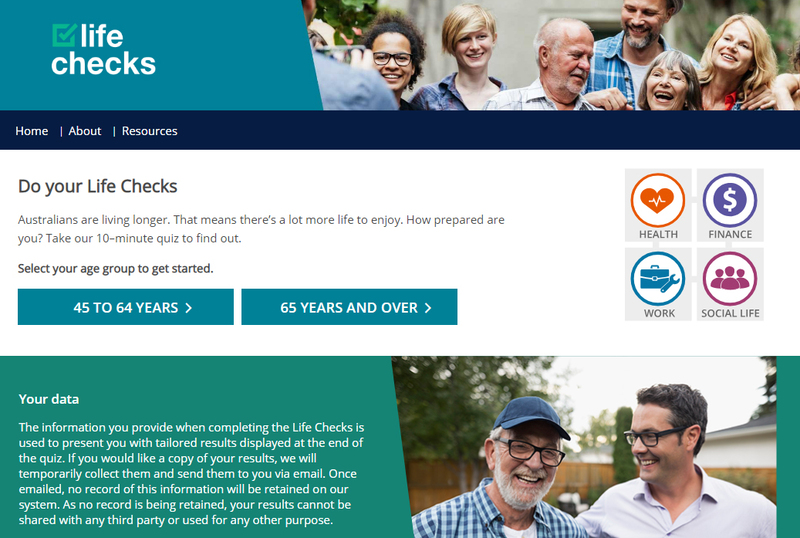 Two Life Checks are available, for people aged 45 to 64 and for those aged 65 and older, with the results and recommendations available via email in an easy-to-read format. An important aspect of Life Checks is also assessing how prepared people are financially for the future. Four in 10 Australians over the age of 55 do not have a financial plan for the next five years. Social and community connections are also essential for healthy ageing, with engagement through some form of work, volunteering or community activities giving people a strong sense of purpose. Taking this Life Checks short assessment online offers encourage and access to resources that can help improve community connection. Life Checks can help provide a clear picture of you are currently tracking in the areas of Health, Work, Finance and Social Connection and you can prepare for the next stages in life and futureproof.